Another loss for Liverpool. This time an interesting tactical idea from Brendan Rodgers failed to have any (positive) impact. Having three at the back in the first phase of their build-up is one of the key aspects of Rodgers’ Liverpool. Normally it’s Gerrard who’s tilting back and dropping between the two centerbacks. They split and effectively create a three at the back in the beginning of their moves. But in this game it was different; it wasn’t Gerrard who dropped back but the right full back Johnson who stayed deep and played quite narrow. This is an unusual tactic which was used by Verbeek at Nuremberg last season and also at Utrecht this season (thanks to @noverheul for the information). Also you could argue that Bayern did something like this in a different manner when they use a false fullback, although Johnson really played in the same line as the two centerbacks. What’s the goal of this tactic? The possibilities are big and depend on the context. One goal could be the most basic of all: Create a 3 vs 2 in the first line, overload their strikers and let the ball circulate stable in the beginning of your build up. Using a deep and narrow full back instead of the defensive midfielders probably means that you want to have more midfield presence and more passing outlets in behind the oppositional strikers. Was this true for this game? Perhaps it was the plan but it didn’t work out quite well. With the three defenders in one line and Allen with Gerrard infront of them they had a good 3-2-formation on paper. In reality it was different; neither was the positioning of the three players in the first line synergistic nor could Gerrard and Allen get the ball behind Newcastle’s strikers. Mostly the shape of Newcastle was not a 4-4-2/4-4-1-1 but rather a 4-4-2-0. This means that the strikers didn’t press the oppositional defenders but were more focused on securing the middle, blocking passing lanes towards the oppositional pivots and defending infront of their own midfield. This worked well as Liverpool’s pivots either dropped deeper and couldn’t receive passes within Newcastle’s formation or were forced to get passes rather wide, which forced the whole attacking play of Liverpool towards the sides where Newcastle was able to isolate them. It also had a bad impact on the decision making and positional play of Liverpool. The defensive midfielders and the three defenders couldn’t build any connections towards the attackers, who in turn didn’t get any good passes, weren’t able to make an impact or to create fast circulation play. The whole game of Liverpool became rather dull, predictable and – most importantly – slow. The circulation of the ball was not fast enough to create problems for the balloriented movement of Newcastle and helped them with their stable defensive work. Another goal Rodgers’ might’ve wanted to accomplish with this formation in build up was to isolate an oppositional player for 1-vs-1-situations with Sterling on the wing, have direct passing options to Sterling and help him to find space. With Johnson deep Sterling in theory could have dropped deeper (and he looked often like a regular wing back in own possession), got the ball and take up speed before he has to beat an opponent. This didn’t work too well either. The problem was that Johnson (or the first two lines in build up in general) never find the needed passing angles for that nor that Sterling made himself available properly in the opened space. Also Newcastle adapted quite well. According to the great Daniel Altman on twitter Newcastle’s wingers Taylor and Gouffran are man marking less and pushing towards the middle, whilst Santon, Ameobi and Obertan man mark the oppositional full back mostly. Probably Rodgers’ speculated that the lack of a right back in build up for Liverpool would create confusion in Newcastle’s midfield and effectively would take one man out of the defense for Newcastle. This was not the case. Newcastle’s left winger moved rather well, he sometimes marked Sterling, sometimes just closed down the space on the wing, went out of the midfield line to press Johnson and force him to a pass or even supported the two centre midfielders when the ball was on the oppositional side; although this was happening uncoordinated and seemed improvised. Another important aspect was the good positioning of the two strikers of Newcastle. They rarely let themselves lure out to press high, instead they kept compact and were playing near their midfield, so Liverpool never had the control in midfield; which more or less destroyed their whole attacking game. Had Newcastle’s striker pressed more actively and consistently higher, probably Johnson’s positioning and the use of Allen and Gerrard in midfield would have paid off. 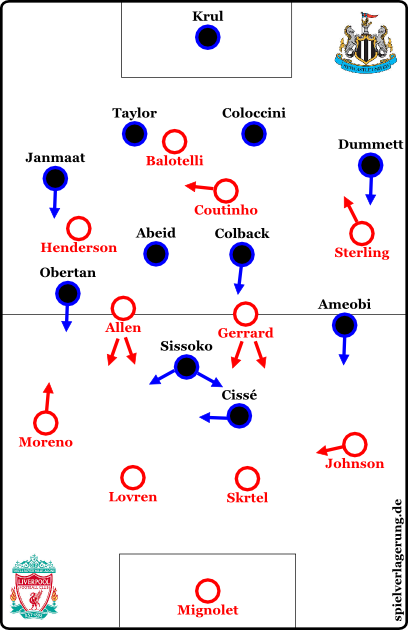 With more space within Newcastle’s shape Liverpool’s players could have combined more frequently, had more space to operate in and the movement of Balotelli, the technical brilliance of Coutinho, the balancing and supportive runs of Henderson and Sterling’s dangerous movements towards the middle from the sides would have been a good idea (in theory, at least). But because of their passivity Newcastle did not have much of the ball, yet controlled the space in their own half without a problem and didn’t concede a single shot for the biggest part of the first half. In the end, it was the mixture of a bad tactical gameplan from Liverpool, the lack of an offensive plan from Newcastle (except to counter fast with the wings and let the full back advance), the stable formation of Newcastle (with some more aggressive manoriented movements in the 2nd half in behind their strikers which sometimes looked even like a 4-1-4-1 for short moments) and the okayish defensive shape of Liverpool (4-2-3-1/4-4-1-1) which created a dull game. Both teams did not have coordinated movements to open space, raise the pace, change rhythm or create effective overloads to let the ball circulate. Newcastle’s personell changes and Liverpool’s tactical ones didn’t make the game much different. While Newcastle only seemed to substitute and more often positioned themselves in a 4-1-4-1 (due to more man oriented movement), Liverpool put Borini into the game, who played as second striker. Coutinho played as left wing but tried to create overloads in the middle – and otherwise they did not change much. Liverpool could not create real chances, mostly it were shots from distances or crosses, whereas Newcastle was slightly better as Liverpool opened more space (especially as they were bad positioned prior to defensive transition); and in the end this was enough to win 1-0. I think Rodgers had picked the left back Dummett as the main weak point. He tends to play very narrow so Rodgers’ plan might have been to drag him out wide and rely on Sterling’s 1v1 ability. I also think that he should have put Henderson on the right hand side of the 2 behind Balotelli because of his ability to explore space behind the opposition’s defence. Dummett had also a very good day, however. The back-four of Liverpool is in my opinion far to deep (don’t know if Skrtel is to slow), especially when losing the ball. They drop to deep and open the space and give (today Newcastle) too much time on the ball (the missing of a counter-pressing today was obvious). And wouldn’t Lallana be a good option against that Newcastle team today. With his technical abilitys he could have open space and be more useful in the build-up of the game for Liverpool. Finally, Rodgers is a good Manager for Liverpool but at the moment he’s way of play is more old fashioned then innovative (missing counter-pressing).